Dana Caspersen with Hubbard Street Dancer Alejandro Cerrudo in Quintett rehearsal. Photo by Todd Rosenberg. 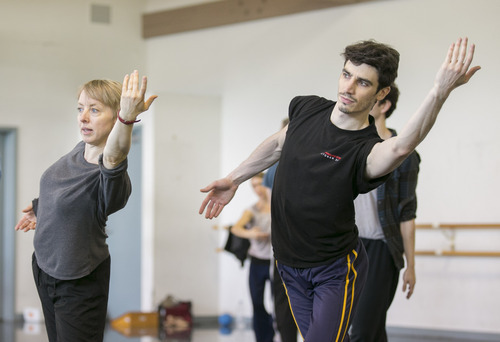 Glenn Edgerton, Artistic Director of Hubbard Street Dance Chicago, finds inspiration in the power of choreographer William Forsythe's Quintett. Created in 1993 soon after the death of Forsythe's wife, Quintett is a personal, powerful work of solos, duets, and trios. "I see it more as an expression of life and a joyful ode to life," Edgerton said. Hubbard Street Dance Chicago will perform the American premiere of the work as part of the dance company's summer series. In addition to this work, the company will also present Malditos by resident choreographer Alejandro Cerrudo, and THREE TO MAX, an original work for Hubbard Street by Israeli master choreographer Ohad Naharin. Recently created for the company in 2011, THREE TO MAX is a collage of past works invoking Naharin's "Gaga" method of movement that challenges dancers to cover studio mirrors and observe and analyze their movements from a variety of different vantage points. The company's summer series takes place May 31 through June 3 at the Harris Theater for Music and Dance. Set to Gavin Bryar's original composition, "Jesus' Blood Never Failed Me Yet," Quintett draws audiences to the visuals of the nuances and relationships of the performers on stage. The music is a meditative, almost chanting piece that couples with the haunting, yet powerful work of the dancers. "[The choreography is] extraordinarily detailed with unique coordination," Edgerton said. "It's challenging physically, stamina-wise. It also brings a group of dancers together in this very personal, very profound way." Hubbard Street Dance Chicago's summer series begin tonight, May 31 at 7:30pm with additional performances June 1 through 3. Tickets for the summer series range from $25 to $94 and are available online, by phone at (312) 850-9744, or at the Harris Theater box office (205 East Randolph).